Announced at San Diego Comic-Con 2018, NICE is American Gothic Press’s first official collaboration with Echo Lake Entertainment! NICE is written by Joseph Ettinger (SANTA CLARITA DIET) and Dagen Walker (BENEATH) and tells the dynamic story of a scarred detective hunting down two inexperienced assassins as they carry out orders for a secret organization. The script comes by way of Echo Lake Entertainment, a film financing and management company that is celebrating 20 years in the industry this year. 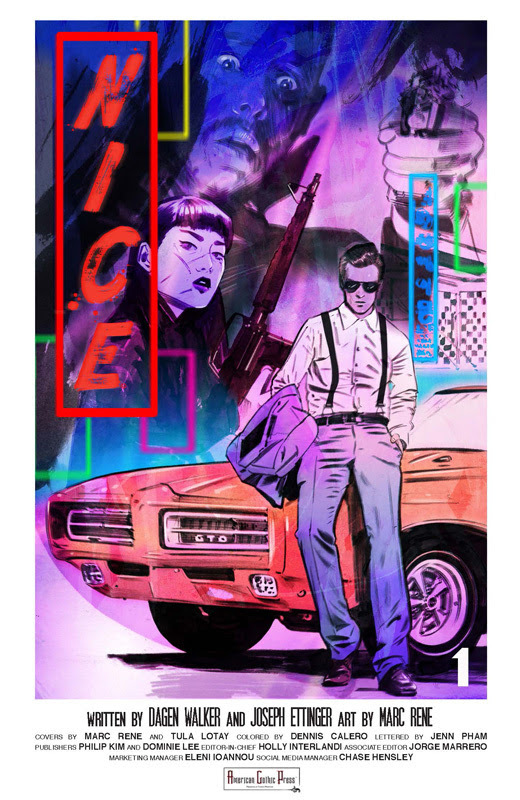 Echo Lake recently signed a deal with American Gothic Press to create original comic books from their upcoming screenplays, of which NICE is the first. Issue #1 is currently featured in the October edition of Diamond Previews with two available covers by interior artist Marc Rene (I, HOLMES) and acclaimed artist Tula Lotay (ALL-STAR BATMAN).